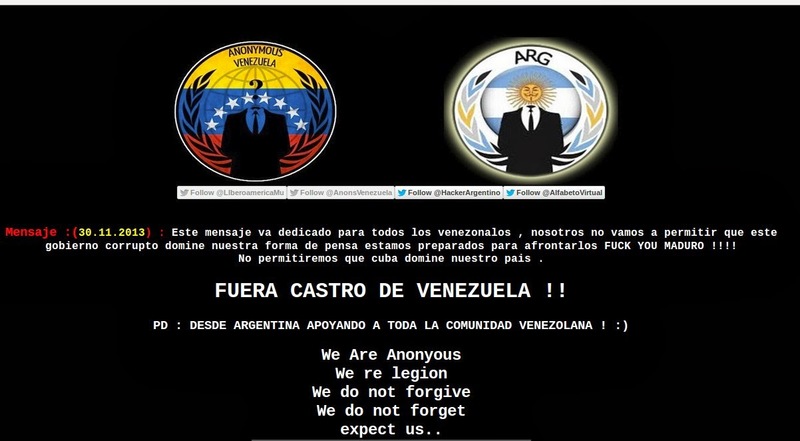 A hacker with twitter handle "LIberoamericaMu" from Hack Argentino team, has gained access to multiple Venezuela Government websites and defaced them. The hacker in tweet said the hack is for Anonymous Venezuela and said that it will be continued. "This post is dedicated to all venezonalos, we will not allow this corrupt government dominates our way of thinking we are prepared to face them MATURE F*** YOU!! Cuba will not allow our country to dominate." The defacement message reads(translated). The group also hacked the sub-domain of the Venezuela Military website "http://esguarnacpuntademata.mil.ve". At the time of writing, all of the affected sites still defaced.